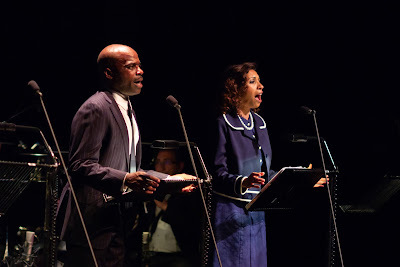 30 years after its premiere, Martin Smith’s affecting musical biography of legendary civil rights movement leader Dr Martin Luther King Jr was revived for just two performances, in a co-production between the Hackney Empire and London Musical Theatre Orchestra directed by Susie McKenna and which marked 50 years since Dr King’s assassination. Opening with a brief, shocking re-enactment of the assassination, the scene was accompanied by the hauntingly mournful vocals of the full cast, shrouded in shadows on stage. Slowly, Debbie Kurup’s Coretta, Dr King’s widow, stepped out of the darkness to sing a few painful lines in memory of her late husband, a moment that was totally engrossing, but extremely brief. 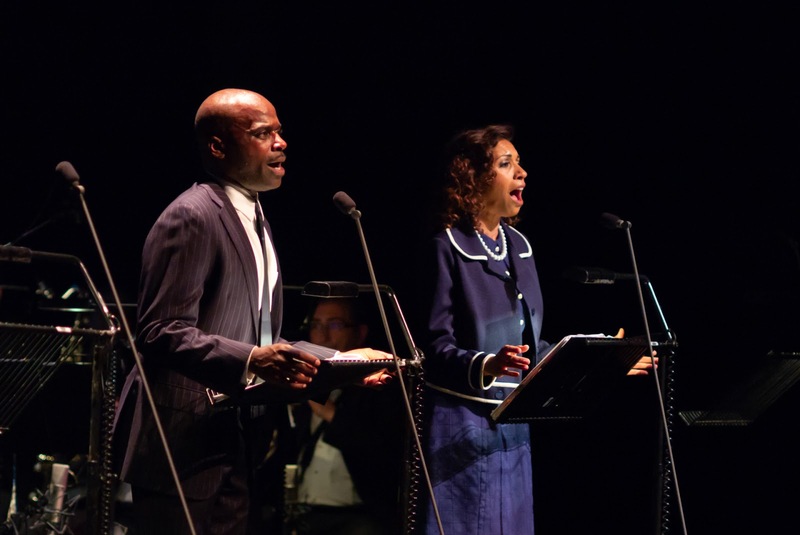 Quickly, the story flashes to the younger Kings as a courting couple, a change of pace that immediately humanised Dr King’s almost mythical figure, inviting the audience to step his life and his journey. Cedric Neal was mightily impressive in the title role. Wearing a look of perpetual apprehension which slowly melted into defiance as his story progressed, he had the audience in the palm of his hand from his very first introduction all the way through to his sudden and tragic demise. Particularly powerful was his interpretation of the iconic I Have A dream speech, which closed Act 1. Accompanied by the orchestra’s slow build to a powerful crescendo alongside the full cast with additional vocal support from Hackney Empire Community Choir and the Gospel Essence Choir. Neal wisely chose not to impersonate King’s intonations, bringing his own heart and charisma to the scene. The staging of the speech was a testament to the intelligent direction of Susie McKenna, and the impassioned performances of the entire cast and orchestra. Under Freddie Tapner’s baton the 22-piece London Musical Theatre Orchestra were perfection throughout. The particularly impressive brass section emphasised the triumphant power of Simon Nathan’s new orchestrations, whilst the strings brought a sense of dreamlike nostalgia to the story that only foreshadowed the painful finale. But for all of King’s heart wrenching musical moments, the story occasionally lacked depth, opting to cover the most significant and well-known moments in broad strokes, rather than drill down into the psyche of its characters and their relationships. 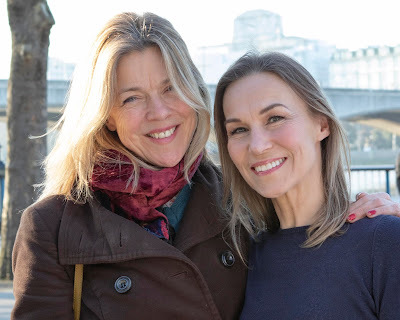 As such, Debbie Kurup as Doctor King’s dignified and supportive wife Coretta, and Sharon D Clarke as his loving mother Alberta, were sadly side-lined as the story progressed. As a reminder of Martin Luther King's immutable legacy Smith’s compelling musical, forgotten for 30 years, deserves a full staging soon, especially off the back of such a striking production.